Warren Deschenaux at podium briefs newly elected legislators in December. Photo above: Warren Deschenaux at podium makes budget presentation to new legislators. 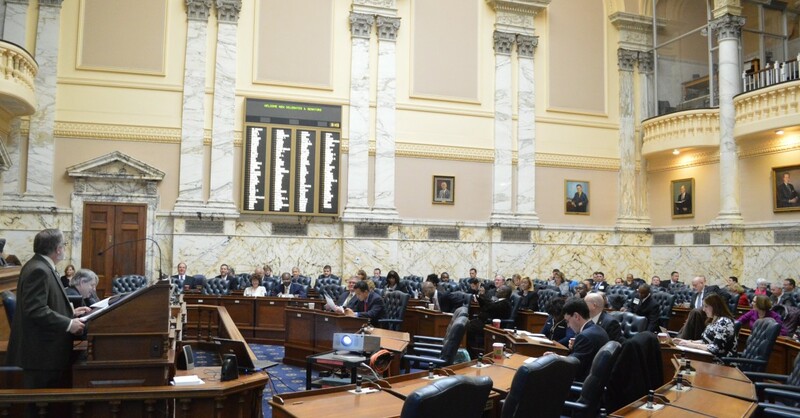 Most newbies in the legislature got a two-day orientation to their new jobs this week, covering topics from ethics and State House security to payroll and office expenses. Next week, they’ll have a three-day bus tour of the state from end to end to get to know Maryland and each other better. But after the elation of their election victories, most of 57 newly elected delegates and 11 new senators got a sobering bucket of budget ice water thrown on them from the legislature’s chief fiscal analysts. The message was not new. Maryland’s revenues are being depressed by lower payrolls for the federal government and its contractors. Deschenaux, director of policy analysis for the Department of Legislative Services, and John Rohrer, coordinator of fiscal and policy analysis, walked the incoming legislators through the funding of public services in Maryland, with money and responsibilities intertwined among local, state and federal governments. Legislative analysts are expecting revenues to grow about 3.9% for fiscal 2016. All this adds up to a previously announced shortfall of about $300 million in the current year’s budget and an almost $600 million structural deficit forecast for next year’s spending. “We are moving from an acute phase of fiscal stress to a chronic stage of fiscal stress,” Deschenaux said, describing the graph above. The fastest growing category of spending is debt service — principal and interest on state bonds, which have been used to help balance the budget. That has been growing about 6% a year. “Something’s got to give,” said Deschenaux. The state property tax is dedicated to paying debt service, but unless the Board of Public Works increases that tax rate — unlikely under Republican Gov.-elect Larry Hogan, who has promised to reduce taxes — more and more of the state general fund must be used to pay off debt on bonds already issued. In next year’s budget, $268 million out of the general fund will be used to pay off debt, and that rises to over $500 million in four years. “We’ve got to deal with our problem,” Deschenaux said. Hogan’s transition budget advisor, former state Sen. Bobby Neall, has been a persistent critic of the increasing debt in recent years. A principal driver of state spending has been the doubling of enrollment in the Medicaid health insurance program, which represents 20% of the total state budget. More than one out of every five Marylanders — over 1.2 million people — are now covered by Medicaid. This is due to a state expansion of eligibility paid for by a $1-a-pack increase in the tobacco tax, more people meeting the low income requirements due to job losses in the recession, and the expansion of qualifying income levels under the Affordable Care Act, heavily subsidized by the federal government at the start.